Colorless lubricant. Use to help zippers, windows and drawers open and slide easier.Instructions:Rub Ezy Zipper Glide along zipper teeth, window tracks and drawer guides. Open and close to see if additional lubricant is needed. Prevents thread from tangling when hand sewing. Will not stain or discolor thread. Instructions:Lay thread end over holder and hold lightly with thumb. Pull thread through a slot to coat. 100% Polyamide For Hems, Trims and Belts. Always test before use. 1. Place Stitch Witchery between fabric layers. 2. Cover with damp press cloth. Set steam iron on "wool" and press for 20 seconds on each side. Do not slide iron. 3. Allow to cool. Check if bond is secure. Press again if necessary. 4. Washable and Dry Cleanable Hem and Cuff Tape is a clear double-facd temporary bonding tape. It is used without sewing or ironing for instant alteration of hems and cuffs, or for quick repair of clothing. It can also be used on draperies, upholstery, craft projects and many other applications. 1. Turn material inside out and spread flat from seam to seam on flat surface. 2. Apply bottom edge of tape along determined hem or cuff line and press firmly with fingers. 3. Remove backing paper. 4. Fold fabric over top of tape and smooth fabric by applying pressure outward from center toward seam. NOTE - Be sure to remove tape before washing to avoid fade line. Prevents fabric from fraying and secures thread ends. Washable and Dry Cleanable.Instructions:Fray Check will not discolor or stain most fabrics. Always test on an inconspicuous seam to be sure. Place a piece of cardboard between area being treated and other fabric layers. Unscrew blue cap and puncture tip with fine pin. Gently squeeze bottle and apply very small amount of Fray Check. Allow to dry for 15-30 minutes. Always keep cap on Fray Check bottle when not in use. HINT-To remove unwanted spots of Fray Check, treat with rubbing alcohol. Test in an inconspicuous area to be sure there is no color change or ring formation. CAUTION - Flammable Contains normal propanol alcohol. Do not use near heat or flame. Avoid contact with eyes. In case of eye contact, flush thoroughly with water. If irritation persists, get medical attention. Keep out of reach of children. Tools not included. Prevents fabric from fraying and secures thread ends. Washable and dry cleanable.Instructions:Fray Check will not discolor or stain most fabrics. Always test on an inconspicuous seam to be sure. Place a piece of cardboard between area being treated and other fabric layers. Unscrew blue cap and puncture tip with fine pin. Gently squeeze bottle and apply very small amount of Fray Check. Allow to dry for 15-30 minutes. Always keep cap on Fray Check bottle when not in use. TIP-to remove unwanted spots of Fray Check, treat with rubbing alcohol. Test in an area to be sure there is no color change or ring formation. CAUTION-FLAMMABLE KEEP OUT OF REACH OF CHILDREN. Contains normal propanol alcohol. Do not use near heat or flame. Avoid contact wit eyes. In case of eye contact, flush thoroughly with water. If irritation persists, get medical attention. 1/4" x 360". Double-sided transparent tape that can be stitched through. Will not gum up needle. Disappears in washing. Use to position zippers, appliqus and pockets. Handy for matching plaids. Create your own bias tapes in minutes. Choose from 5 different sizes from 1/4" to 2". Perfect for Celtic Quiting, binding and more. Wonder Clips are easy to see and easy to find when dropped on the floor! Bobbins not included. 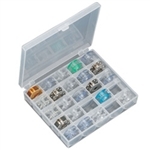 Store and organize sewing machine needles with Needle Grabbit® Needle Memory™! No more lost or unidentified needles because they have been removed from the package! Needle Grabbit has “cells” for most types of needles and their standard sizes. Just slide a needle into the loop strip of the proper “cell” and it stays put. Label blank cells with a ballpoint pen on the write on/wipe off surface to create spaces for specialty needles. Needle Grabbit comes with an “in use” pin marker to put in the cell of the needle you are currently using in your sewing machine. It comes in a clear vinyl storage pouch. Unit measures 5 1/2"x7 5/8". 3/4" wideFor hems, trims and belts. Washable and Dry Cleanable.Instructions:Always test before use. Place stitch witchery between fabric layers. Cover with damp press cloth. Set steam iron on "wool" and press for 10 seconds on each side. Do not slide iron. Allow to cool. Check if bond is secure. Press again if necessary. Random Colors are shipped. Cut patterns without pinning! Sewing tools not included. The Crafter’s Comfort Gloves provide relief for arthritis, hand pain and swelling and cold hands. The Crafter’s Comfort Gloves are sold in pairs and are available in small, medium and large.